“The University is heavily invested in esports, through both this event and our Business of esports course that will help develop professionals in the industry with event management and business skills." 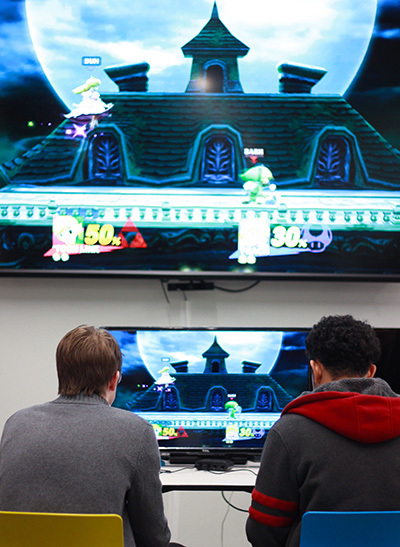 The Rowland School of Business at Point Park University, in partnership with the Pittsburgh Penguins, Cleveland Cavaliers and Pittsburgh Knights, is presenting a multi-game esports tournament May 11-12, 2019, at the Pittsburgh Playhouse. The Steel City Showdown will feature competitions in three games — Super Smash Bros., NBA 2K and NHL 2K — with prizes of $1,000 for first place and $500 for second in each tournament. “It’s long overdue for Pittsburgh to really get behind one of these tournaments, and our Playhouse is the perfect venue for it,” said Steve Tanzilli, J.D., dean of the Rowland School of Business and chair of SportsPittsburgh’s esports task force. “The University is heavily invested in esports, through both this event and our Business of esports course that will help develop professionals in the industry with event management and business skills," Tanzilli added. Pittsburgh does have an established esports presence through the Knights, the city’s first professional team. Len Komoroski, CEO of the Cleveland Cavaliers and Quicken Loans Arena, said esports is rapidly growing in popularity from Cleveland to Pittsburgh and beyond. “This may be the first esports tournament for many gamers in the Pittsburgh area, so we are excited to help bring this to life and provide a fun and educational experience for all those who attend,” Komoroski said. Tickets for both spectators and competitors are available online via the Pittsburgh Playhouse website. Spectator tickets are $5 per day. Competitor fees are $10 for Super Smash Bros., and $20 each for NBA 2K and NHL 2K. "Pittsburgh's first esports event announced: 'Steel City Showdown,'" WTAE-TV, March 26, 2019. "Esports Tournament Coming To Pittsburgh," KDKA-TV, March 26, 2019. "Point Park University Ahead of the Game in the esports Industry"